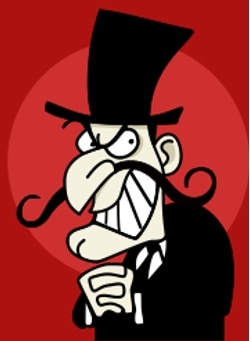 Bookshop Talk: Villains . . . Characters we LOVE to HATE! Villains . . . Characters we LOVE to HATE! Protagonists vary from book to book as widely as people vary from household to household. J.K. Rowling’s protagonist, Harry Potter, is a boy wizard who defeats the truly evil Lord Voldemort. Jane Austen’s protagonist, Elizabeth Bennet, is a gentile young woman who finds love with the person she least expects. Antagonists vary in their characters and modes of operation, too. 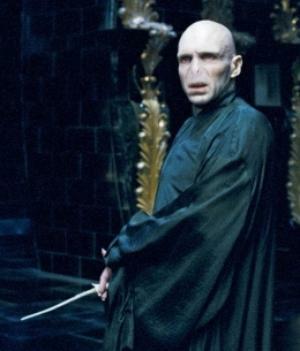 As mentioned above, Lord Voldemort actively opposes Harry Potter . But who or what is Elizabeth Bennet’s antagonist? Man vs. Self: The protagonist and the antagonist are the same person— perhaps someone who is struggling with an addiction. Man vs. Man: The protagonist and the antagonist are both human (or at least similar creatures)—Harry Potter vs. Lord Voldemort is an example of this kind of conflict. Man vs. Society: The protagonist’s adversary is society itself. For example, consider the story of a young woman who is born with a physical deformity in an era when deformities were seen as signs that the afflicted persons were in league with the devil. The protagonist’s enemies fear her, despise her, and mistreat her because of superstition. While a certain person may embody this superstition and actively oppose the young woman as the antagonist in the story (Man vs. Man), the antagonist can also be seen as society itself, because the antagonist was indoctrinated by his culture. Let’s get back to figuring out who Elizabeth Bennet’s adversary is in PRIDE AND PREJUDICE . Mr. Bingley’s sisters are certainly awful, and then there’s Mr. Wickham. But what about the fact that Elizabeth, her mother, and her sisters will be homeless once her father dies (remember, her family estate is “entailed”)? Money and situation drive Mr. Bingley’s sisters and Mr. Wickham to act evilly. Money and situation in society cause problems for Miss Elizabeth. Her antagonist is, likely, her own society. Man vs. Nature: The antagonist is something from nature. Think of disaster stories, or mountain-climber stories. I love it when an author writes about a storm, for example, and uses descriptions that make it seem like the storm is alive and actively opposing the protagonist. Man vs. Machine/Technology: Mary Shelley’s novel, FRANKENSTEIN , is the classic example of this kind of conflict. However, is Dr. Frankenstein truly the protagonist? Can you think of any other books where the conflict is Man vs. Machine/Technology? Man vs. Destiny: In Rick Riordan’s first Percy Jackson novel, THE LIGHTNING THIEF , Percy learns that he is the son of a mortal woman and the god Poseidon. Because of this, he is being sought out by evil mythological creatures who want to kill him before he can train to become a worthy foe. Certainly, there are human/immortal antagonists in this story, but it is also a story of a boy who discovers his origins, fights against his destiny, and finally embraces it. Perhaps this could be a Man vs. Self conflict, too. While I’m very interested in story conflict of all kinds and in antagonists of all kinds, I’m particularly interested in villainous people who personify a character’s worst fears. Not a lighthearted subject, but an interesting one. Let’s go back to the Harry Potter example. Lord Voldemort is a terrifying foe–particularly terrifying to Harry, because Harry worries that he is too much like Lord Voldemort. Harry fears that he and the Dark Lord share too many similarities. For a while, Harry is as afraid of himself as he is of Voldemort. This makes for a wonderfully believable and terrifying antagonist. But there are other great villains in the Harry Potter novels. Consider also the horrid Dolores Umbridge. She pretends to be sweet and motherly, which makes her purely terrifying. Then there’s Rita Skeeter–a woman who is so absorbed in her own success that even if she causes untrue rumors to circulate about others, she doesn’t care. She’s annoying, like a mosquito. Buzzing, like a mosquito. And how about the Dursleys? They’re awful, but their hold over Harry lessens the more he learns about himself and about the power of magic. Shall we consider Draco Malfoy? As much as we despise him, we begin to feel sorry for him when we learn what kind of family he has. Of course, we still don’t like him, but he’s not pure evil, like Voldemort or even Umbridge. Who are your “favorite” villains? Why do they work so well for you? Cruella De Ville is one of our family favorites around here! Hmmm...one of them is Lord Arawn from The Chronicles of Prydain. You never actually meet him or even see him until the end of The High King, but you can sense his evil and his hold over Prydain. He's kind of like Voldemort, but he tends to use other people more to do his "dirty work" for him and he protects himself by never exposing his person openly. Like by being able to take on the physical likeness of any mortal creature. Oh, I love this topic! Bwwahhhaaaaaahhaahhaaa! Voldie is by far the character I love to hate most. Probably because Harry Potter is the character I love to love most. He's the ultimate bad guy with out an ounce of mercy. I've bitterly disliked some "mean girls" in several books, too. Ella's two step sisters, for example, in Ella Enchanted. The Man Jack in THE GRAVEYARD BOOK . . . oooooo chills. Ooo..."good" villains, everyone! Keep 'em coming! I think what make Dolores Umbridge such a great villainess are her absolute conviction, her total respect for authority, and her complete lack of sympathy for anyone she sees as a rebel. I'm currently reading THE PAWN by Steven James, a thriller/mystery. The antagonist calls himself the Illusionist, and is narcissistic and psychopathic. Two great "Man vs. Nature" books (both nonfiction) are INTO THIN AIR and THE PERFECT STORM. Ooh! Another great villainess is Selia from Shannon Hale's THE GOOSE GIRL. She wants to be queen and thinks nothing of starting a war to achieve her goal. Laura: I was going to do Selia! I was thinking, 'Ooh, what about Selia' a mere SECONDS before reading your post! Great post Kim. \\I love the demons and wizards in Sarah Rees Brennan's books lots of pure evi going on there. Also President Snow in the Hunger Games ~ oh he was chilling! I love MC villians, e.g. Artemis fowl. Because he's bad, but you love him. Basically, I love villains who are internally conflicted in some way, not just purely evil. Of course, I also love (to hate) Voldemort and Umbridge. I also kind of hate Barty Crouch senior, because he was such a jerk.